Cupcake bouquet with two kinds of minicupcakes and silk paper “leaves”. 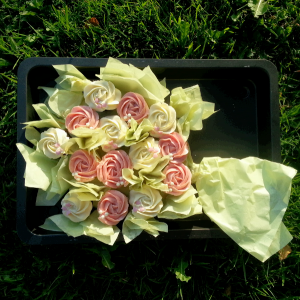 The cupcakes are fastened with toothpicks to a polystyrene plate wraped in green silk paper. 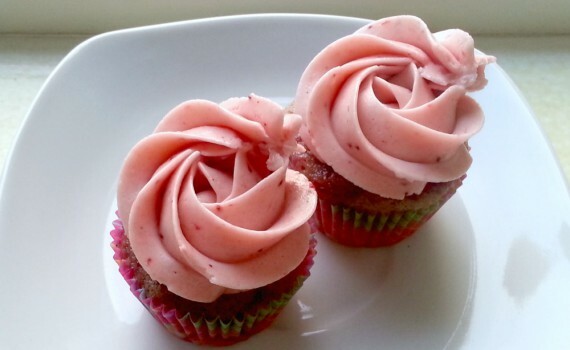 I was inspired by this recipe for vanilla cupcakes with swirls of pureed fresh strawberries. But since it is not yet strawberry season in Denmark, and since I kinda think it is almost a sin to bake those lovely fresh strawberries when they are actually in season, I went for my homemade berry syrup with strawberries instead. This way you still get the wonderful intense strawberry flavour, and the recipe can be used all year. 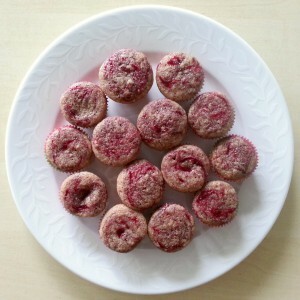 I also mixed the recipe up a little with my favourite vanilla cupcake recipe – the one I use for instance for my raspberry slice cupcakes – and reduced the amounts of butter and sugar. I prefer to bring out the sweetness from the vanilla and the strawberry syrup instead of refined sugar. I followed the original recipe and mixed some strawberry syrup into the batter in addition to the strawberry swirls – next time I will skip this step and have removed it from my version below, as it gives the cupcake batter a funny, not too pretty colour. Better to maintain the beautiful light yellow colour of a plain vanilla cupcake and use a little extra strawberry for the swirls instead so you can enjoy the beautiful contrast you get. Vanilla cupcakes with strawberry swirls ready for the strawberry buttercream frosting. Preheat the oven to 175 degrees Celsius and prepare a muffin form with paper liners. Sift flour, baking powder and baking soda into a medium-sized bowl and fold it gently together. Put to bowl aside. Cut the vanilla bean pod open and scrape out the seeds. Use the knife to mash and mix the seeds together with a little of the sugar to separate the seeds. Whip butter, sugar and vanilla seeds into a light and fluffy mixture. Add the lightly beaten eggs and mix it together. Use wooden spoon or similar to gently fold in 1/3 of the flour mixture – preferably sifting it once more. Add the milk, then another 1/3 of the flour, the buttermilk and the rest of the flour, gently folding to incorporate between each addition. Be careful not to overmix. Divide the batter between the paperliners – they should be aboout 2/3 full – and drop a small dollop of strawberry syrup on top of each. Use a toothpick or similar to make swirls. Bake for 13-15 minutes (a little more of you are making regular-size cupcakes), until a toothpick inserted into the middle of a vanillacupcake comes out clean. Leave the cupcakes to set in the form for a few minutes before transferring them to a cooling rack. Allow your vanilla cupcakes with strawberry swirls to cool off completely before adding the strawberry buttercream on top. 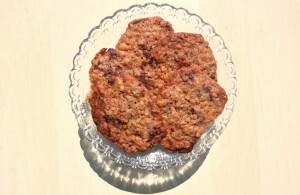 Using a hand or a stand mixer, beat the butter until it is white and fluffy – about 2 minutes. Add the powdered sugar, preferably in 2-3 additions, and beat until the butter and sugar is smooth and fluffy. Add vanilla extract and whip until incorporated. While beating at low speed, add the cream one teaspoonful at a time and then whip until all the cream has been incorporated, and the buttercream is smooth again. 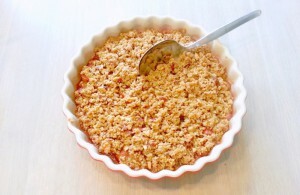 Add the strawberry syrup – start by 4 tsp – and whip until the frosting is lovely smooth and fluffy. 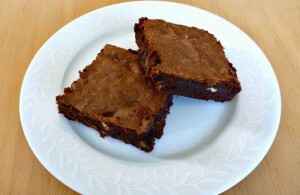 Add extra syrup to taste if you want – you can also add extra cream to get an even creamier flavour and consistency. Your strawberry buttercream frosting is now ready to come on top of your cool vanilla cupcakes with strawberry swirls – serve at room temperature. For the type of bouquet in the picture above you need about 14 minicupcakes, 1 circular polystyrene plate (with a diameter of ab. 21 cm), 2 large sheets of green silk paper, some tape and a packet of wooden toothpicks. Use one sheet of silk paper to wrap the polystyrene plate and form the “stem” and one for cutting silk paper squares to use for leaves. 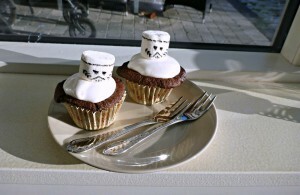 Use two halves of a wooden toothpick to attach each minicupcake to the plate so that it won’t rotate. Insert the blunt ends of the toothpicks into the polystyrene and press the cupcakes down onto the pointed ends. It is a good idea to try to arrange the cupcakes on the plate before inserting the toothpicks – remember to leave a little extra space between the cupcakes here and there if you want to add silk paper leaves. If not, you can use a few extra cupcakes instead. Attach your cupcakes to the polystyrene plate before adding the frosting – you may need to press down on top of them to get the toothpick to penetrate the paperliners. Allow your bouquet to cool for a little while after adding the frosting but before adding silk paper leaves (which you can also attach with half a toothpick) – this way your frosting will be firm and won’t be as easily damaged by the paper rubbing against it. 30 minutes should probably do it, try and see.